Just like you and I lose strands of hair regularly, so too do our canine companions. 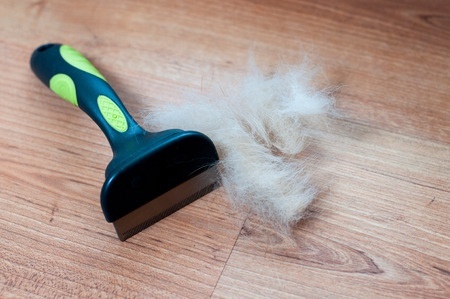 Dog fur sheds regularly as old and damaged hair falls out, often finding its way to the carpet, couch or the all black shirt or pants you’re wearing. Brushing is a great preventative way to reduce the excess hair, but what if it seems like there’s more fur than usual? Here’s a look at a few leading causes of excessive shedding in dogs. Most dogs are predisposed to growing extra fur during the colder months, especially if they spend any time outside during the winter season. After the weather breaks and the temperatures rise, the extra thickness of their coat is no longer needed, and your four-legged friend will begin to shed away the extra fur. If you’re seeing more shedding than normal, it may just be a result of the natural thinning process that works to help keep your pet seasonally warmer and cooler. Did you recently move or has there been a major new introduction into your puppy’s regular routine? Some dogs deal poorly with stress – just like some people – and this may lead to more shedding than usual. Think about any recent changes that may be at fault, and keep an eye on your dog’s behavior to look for any other potential causes that might be at fault. While most dog food available on the market is formulated to give your friend a fully nutritious meal and a balance of needed nutrients, sometimes an allergy or sensitivity might make your dog need more than they’re getting from their regular food. The American Society for the Prevention of Cruelty to Animals notes that if your pet seems to show signs of excessive shedding – especially if you made a recent change to their regular food – you may want to try a different brand or consult with your veterinarian for recommendations on the best diet for your dog’s breed. Sunburns hurt, sting and sometimes peel, not to mention are incredibly irritating on the skin. The situation is no different with dogs. If your dog spent a full day in the sun alongside you, there’s a chance that he or she got sunburned and may be treating the burnt area with extra sensitivity or it may be itching which is leading to more shedding and fur loss than normal. Keep in mind that beneath their fur coats, they have sun-sensitive skin as well, and try to balance your time outside between shaded and covered spaces and time soaking in the rays. Lastly, one of the culprits for excessive shedding may be pests. Fleas, lice or other biting bugs can make your dog itching, and this extra skin irritation and constant digging with his or her paws can cause more fur to find its way onto your floors. If you see more than usual, and especially if your dog seems to be itching more frequently, check for signs of these parasitic pests. Be sure to take your pet to the vet if you do find symptoms to get him or her treated right away and prevent the infestation from spreading or worsening. Keep in mind, as well, that there a number of dogs that tend to shed far less than other breeds, including many of the breeds that we sell, like maltese, miniature schnauzers and Yorkshire terriers. If you have one of these breeds and are noticing shed fur, you may want to check through this list or consult with a vet to ensure that there’s not a more serious problem occurring. For more information on these breeds – or to find a new friend for your home! – contact us today!